This pendant will update your home with its eye-catching design. Featuring a chrome finish and clear outside; matte opal inside shade(s), this fixture will accommodate a variety of dicor styles. With its easy installation and low upkeep requirements, this pendant will not disappoint. A centerpiece for the home, this hanging light fixture features captured rings of crystals imparts a luminous silhouette redefining luxury in lighting. This is a statement maker with endurance to last. Made with solid steel construction to look great and last for years to come. 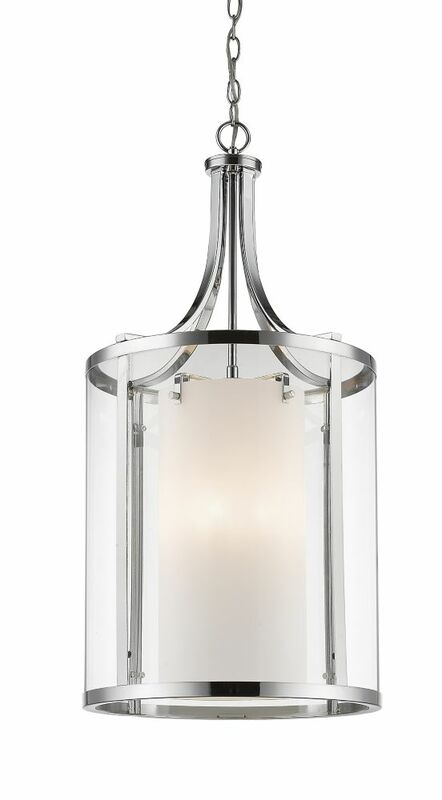 8-Light Chrome Pendant with Clear and Matte Opal Glass - 16 inch This pendant will update your home with its eye-catching design. Featuring a chrome finish and clear outside; matte opal inside shade(s), this fixture will accommodate a variety of dicor styles. With its easy installation and low upkeep requirements, this pendant will not disappoint.